How do plant achieve immunity against Have you ever thought, how do plant achieve immunity against Phytopathogens? How do they achieve systemic immunity without circulatory system and mobile immune cells? This article, is an attempt to provide a bird's eye view to the above stated questions. Phytopathogens are microorganisms which specifically attacks the plants for their surv..
Have you ever thought, how do plant achieve immunity against Phytopathogens? How do they achieve systemic immunity without circulatory system and mobile immune cells? This article, is an attempt to provide a bird's eye view to the above stated questions. Phytopathogens are microorganisms which specifically attacks the plants for their survival and proliferation. Bacteria and fungi tries to achieve their survivability and proliferation, either by killing the plant host so as to feed to feed on their nutritive materials or co-exist with plants, as they require a living host for their existence. On the other hand, for viruses, there is need for living host initially for their survival, later they kill the host for their proliferation. Till date, there about 150 bacterial species, 8000 fungal species and 920 viral species which are Phytopathogens has been identified. Plant immune system is capable of identifying invading microorganisms and effectively suppress their invasion. One of the initial measures of host defense mechanism is reinforcing their cell wall by depositing callose, lignin, suberin and cell wall proteins. Like, vertebral pathogen associated molecular pattern recognition receptors, plants do posses these pattern recognition receptors which aids in identifying the pathogens (for e.g. : Identifying as gram positive or negative bacteria) that has invaded. To overcome pattern-triggered immunity (PTI), pathogens produces effector molecules, which in-turn aids in pathogen virulence and subduing immune response. Through evolution, plants have learned in recognizing these effector molecules (by R proteins) and trigger effector based immunity (EBI). Distinctive characteristic of EBI is hypersensitive response; it includes programmed cell death (PCD) of infected cells, anti-microbial secretion, etc. In-short, PTI is a general response and EBI is more of specific towards to effectors which are produced by pathogens. During evolution, R proteins have started recognizing modified self-antigens and triggers cell death. Yes, autoimmunity is not only present in vertebrates, they do exists in plants!!!. This could be one of possible reasons behind certain incompatible cross results in necrotic, non-viable and sterile offspring. This would initiate the interests in scientific community in studying how to avoid autoimmunity during domestication of plants, also, how outcrossed varieties of maize has circumvented these processes. Essentially, these R proteins should be more of dynamically expressed, rather than constitutive. Many properties and mechanisms related of R proteins remains elusive. Next thing is understand how plants achieve systemic immunity without having circulatory system and specialized mobile immune cells. After Frank Ross experiment, who discovered that locally infecting the tobacco plants with tobacco mosaic virus (TMV) would results in resistance to TMV and other pathogens at least for more than 20 days. This experiment has paved a way for how do plants acquire systemic immunity? How did plants recall previous pathogen attack? In this article, more concentration would be given on mobile immune signals. Mobile immune signals should be secreted near infection area and it should be transported to other parts of plants and probably with an "encrypted information" about the pathogen. Currently, this hypothesis largely accepted in scientific community. Transport of these mobile signalling molecules happens through phloem (plant's vascular system which transports the nutrients synthesized by leaves to other parts of plant). Recent finding by Fu et al shows that salicylic acid acts as signalling molecule for providing both local and systemic immunity. Salicylic acid is produced in high concentration at infection region and its concentration gradually decreases from infected area to non-infected region. Non-expresser pathogenesis-related genes (NPR) - 1 guides the cells to undergo PCD as part of immune measure. Salicylic acid concentration drives the function of NPR1. Other components in the machinery are NPR3 and NPR4 which also plays an important role in this process. NPR3 has a low affinity towards to salicylic acid, whereas NPR4 has high affinity. 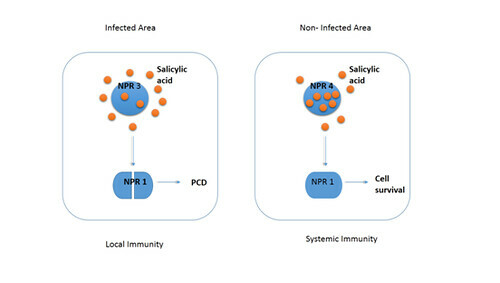 At infection area, high concentration of salicylic acid results in binding towards NPR3, apart from binding to NPR4. The process results in recruitment of proteasome machinery which specifically degrades NPR1. NPR1 degradation results in apoptosis of the cell (Fig 1). Salicylic acid protects the non-infected cells by transgenerational immune memory, anti-microbial secretions, etc. By this, salicylic acid causes cell death at infection area and protects the non-infected cells also. In addition to salicylic acid, other immune signals identified till date are azelaic acid, glycerol-3-phosphate and jasmonic acid. Interdependence of these signalling molecules remains largely elusive. It should be noted that all the above mentioned mechanisms holds good for the pathogens which depend on the host during their lifecycle. There are other mechanisms by which plants protect them for pathogens which kill them and feed on their nutritive materials and herbivores insects. Also, these mechanisms may not holds good for the root system. Just like jawed vertebrates' digestive system, many symbiotic microorganisms are present. How the immune system in root recognizes the pathogenic from symbiotic microorganisms is not known. All these unanswered questions makes the plant immunology an enigmatic and this drives our grey cells to be active!!! 1. Fu et al., NPR3 and NPR4 are receptors for the immune signal salicylic acid in plants. Nature. 2012 May 16; 486(7402):228-32. 2. Spoel et al., How do plants achieve immunity? Defence without specialized immune cells. Nat Rev Immunol. 2012 Jan 25;12(2):89-100. 3. Muthamilarasan et al., Plant innate immunity: an updated insight into defense mechanism. J Biosci. 2013 Jun;38(2):433-49. 4. Gust et al., Plant immunology: A life or death switch. Nature. 2012 Jun 13;486(7402):198-9.